Once in awhile I do make a dessert that is not covered in icing. I love baking so cookies, muffins, pies, etc all come out of my kitchen. I've already been asked if I was going to make buckeyes this Christmas. They are the peanut butter balls coated in chocolate and look like buckeyes. If you've never had one, try one. They're excellent! This particular dessert was made for Thanksgiving. 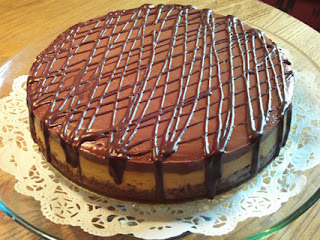 It is a double chocolate pumpkin cheesecake. I'm posting it because people thought I just bought the darn thing. That's funny. My husband, while we were shopping for the cheesecakes ingredients, said, "Mrs. Smith's pies are buy-one-get-one-free. Why don't you just get that for Thanksgiving?" I just shot him a look. I don't buy food for thanksgiving. I make food for Thanksgiving. Well, except for the jellied cranberry sauce. I LOVE that stuff!